I was sitting here last night trying to stay warm and tatted these two little motif's. 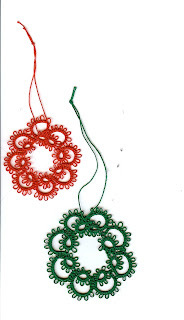 This is from Tatting for Today motif 25. There are a lot of motif's in this book. It would take me a year to do all of them. Maybe a project to attempt. I am also working on a rosette for Georgia. It is an assignment left over Monday night's Classic Wheel lesson. I have the inside of the rosette done and am trying to decide to finish the last two rounds. Cute Christmassy colors! Nice Motif!